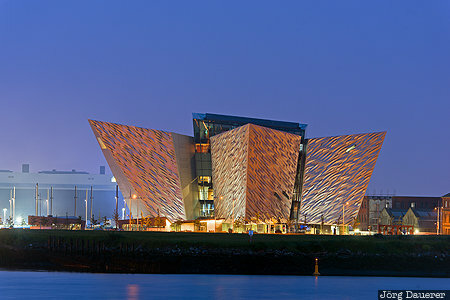 The flood-lit Titanic Belfast Museum in Belfast with River Lagan in the foreground at the blue hour after sunset. Belfast is the capital of Northern Ireland, United Kingdom. This photo was taken in the evening of a cloudy day in June of 2016. This photo was taken with a digital camera.